its hard to believe that you’re gone Ngae..
it was like seconds ago when i last called you..
not that you’re literally gone..
but the news of your passing..
you had a lot of admirers, fans, wannabes ! i am plainly one of them. remember we were training for Powerman together in Putrajaya? or was it for Desaru..
be your last Powerman.. and we crossed the finish line together ? That moment will always be cherished.. I remember you told me..
you’re always power and muda Ngae..
as usual,a photo for memories sake..
well, i didn’t expect that sake would come to soon. you will always be remembered, remember that. that would be cool too..
i got the idea of the wifi from Stupe. I wish I had been a better friend.. I wished..I cared..to listen.. but its all a bit too late now..
all that i can do is pray for you dear friend..
Ngae.. I will upload the video i took of you here ..
and also some pics of us ! p.s. to all reading this, there will be a minute of silence dedicated to Ngae before the NB15k start tmrw AM. do show up in your sarong if you have any aight..
Ngae and I ..2 years ago.. we were training for Desaru/Powerman. Can't remember which 1.. we had fun running in the hot sun and he actually showered at the floor fountain on the Putrajaya boulevard , at the small roundabout. so fun ! Ngae and i at Shihming and Doc Ray's birthday bash at Ronnie Q, Bangsar. That's typical Ngae by the way, him, the sarong, the loose shirt/singlet, a cap and that sling bag. 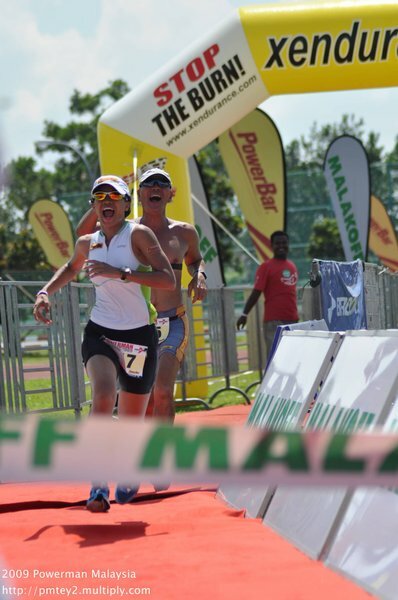 Your last Powerman.. we crossed the finish line together. ... we ran the last few ks together too.. i remember you had to slow down because it was so hot..
Little did I know that this would be your last Powerman.. and our last hug !! 😦 You will always be remembered dear Ngae. mmuah, Julie. I never had a photo with Ngae simple because he is too fast, even on his sunset days, for me to catch. that was PD tri last year. PD will be a tri tribute to him. Sofian suggested to pakai sarong for the run ! lets race in his memory ya Stupe… smlm so sedih la think of him… I hope he is in a better place..
We will miss you. You are my inspiration. RIP Ngae! Thank you Kok Aik Tan. I will compile all the comments and condolence message from you guys and pass it to his family. may Ngae rest in peace. A friend will be missed. Was quite shocked when accept the sms in the middle of the night regarding him passed away. 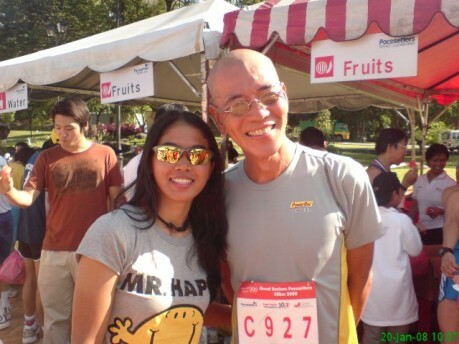 my first contact with him was scklm 2009. .. . . RIP Ngae… you will be miss by many. anyone knows when & where is the wake? Shihming, i am glad as well.. in fact i am still digging up some old pics and videos frm my computer. all over the place ! he will dearly be missed. you take care ok.. let’s make it a point to catch up next week. will sms you aight. ijam : yeah.. glad u noticed. in fact during the run ada yang tanya, and did get the meaning of what i wrote on the vest. he will always be remembered.. Thanks Fairul 🙂 he will be close to our hearts. are you doing PD tri ? planning to do a minute silence before the start. sarong not so sure. maybe save it for KL Marathon. We love you Ngae, you will be so dearly missed but not forgotten.